£100 deposit for 7 nights, refundable up to 4 weeks before holiday. Balance payable 4 weeks before stay. Cancellations after this date will be offered a stay at a later date, no refunds. 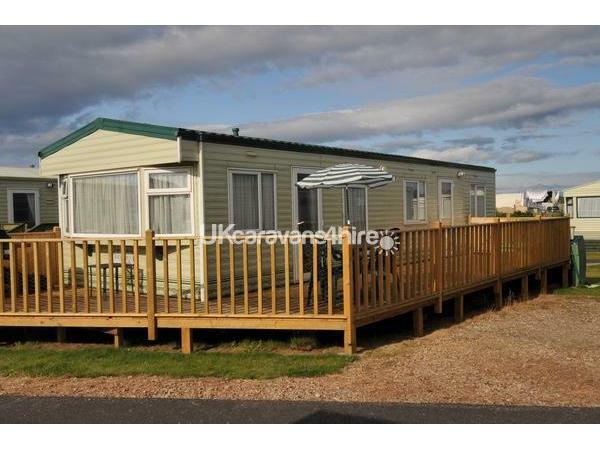 Our spacious holiday caravan has double glazing, central heating and a very large, fully enclosed decking area, ideal for dogs and children. 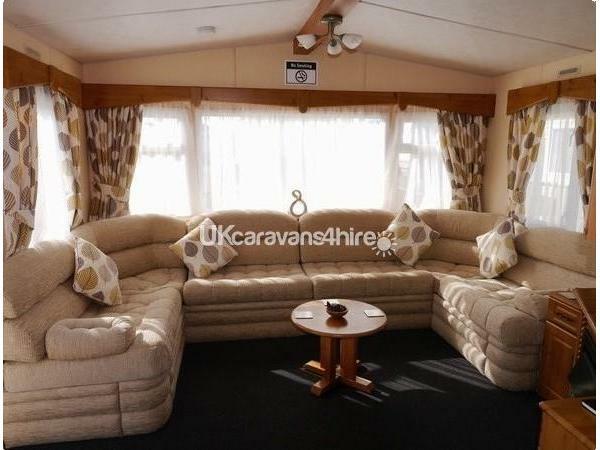 It is south facing and extends around the front of the caravan allowing you to enjoy the evening sun too. Outdoor seating and a barbecue provide the perfect set up for al-fresco dining with beautiful views across heather and gorse to the nearby woodland walks. The beach is 5 minutes away. 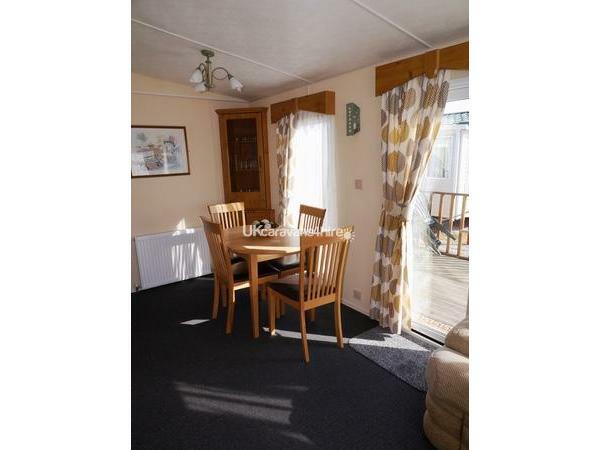 The caravan is well equipped and has 3 bedrooms; a double, twin and single bedroom with room for your own travel cot if required. It has all the usual mod cons; central heating, double glazing, full oven, fridge with a small freezer, microwave, Freeview TV and DVD player, and of course FREE Wi-Fi. We take your comfort and safety very seriously. Our caravans have an annual gas safety check by an LPG technician and are fitted with carbon monoxide and smoke alarms, fire extinguisher and fire blanket for your reassurance. From the site there are picturesque woodland walks and cycle paths and of course the beautiful golden, sandy beaches that Lossiemouth is famous for. A wealth of birdlife can be spotted on the estuary adjacent to the site. There is also the RSPB Loch Spynie Nature Reserve 10 mins Drive away. The beautiful estuary and golden sands of Lossiemouth Bay are only a 5 minute walk from the caravan, ideal for dog walking and families. The town of Lossiemouth enjoys the mild climate of Moray and boasts a thriving esplanade and marina with gift shops, restaurants and tearoom. There are many places offering good bar meals and there is a family run, seafood and pizza restaurants and a popular local restaurant by the marina for lunchtime and evening dining. There is of course the usual selection of fish and chip, Italian, Chinese and Indian takeaways. A pharmacy, bakery and newsagent can also be conveniently found less than a 10 minute walk from the caravan park. For self catering, there is a town supermarket, with further larger stores in Elgin, a 10 minute drive away. Other amenities in Lossiemouth include children's play parks, an indoor swimming pool and a golf driving range. If it is a walk around 18 holes you prefer, there is a beautiful links golf course in Lossiemouth, with many other local courses to choose from to challenge your game. The Moray coast has a wealth of places to visit. Dolphins and whales can be seen all along the Moray coast with regular sightings at nearby Hopeman & Burghead. Boat trips are an excellent opportunity to get up close. The local historic city of Elgin, with its cathedral, shops and many retaurants, is only a 10 minute drive away and there is a bus service late into the evening, every 20 minutes, less than a ten minute walk from the site. For rainy days, Elgin has a cinema, museums, a leisure centre and ice rink, tenpin bowling and go karting so the kids will never be bored! There are fantastic activities all around for little ones, right up to teenagers (and the young at heart!). Soft play, play parks, cinemas, Landmark Woodland Adventure park. Grass Sledging, Quad biking and Archery plus a lot more at The Loft at Kinloss. There is even a Skate park by the beach at Hopeman, the next village along. Our 'To Do' information pack at the caravan is bursting with ideas! North, South, East and West, there is lots to do for quieter days. The Coastal Path with fabulous views, an abundance of beautiful drives with coffee and lunch stops along the way. For visitors looking for a more Scottish feel to your holiday, the Speyside Whisky trail is right on our doorstep, with several Scottish castles and gardens in the area too. There is a wealth of distilleries with visitor centres and tastings! The city of Inverness with its famous Loch Ness monster, Culloden Moor Visitor Centre and great boat trips is about an hour away. All in all, our caravan at Lossiemouth Bay Caravan park has the best of both worlds, beautiful Scottish woodland, coastal scenery, with city life and tourist attractions within easy reach. Our returning custom speaks for itself!